Send marketing or transactional SMS directly from the Shopify back office. IMPORTANT: You need to have a SendinBlue account to use the SendinBlue plugin. You can create an account for free in just a few seconds. Go to this URL to install the free plugin: https://apps.shopify.com/sendinblue. Click on the Install app button. If you're not already logged in to your Shopify account, you will be asked to do so. Finally, you'll have to agree to install the plugin by clicking on "Install app". Activate the SendinBlue plugin by clicking on "Yes" and log into your SendinBlue account to obtain your API key (available here). Then click on the "Update" button. Activate subscriber management by SendinBlue and select the lists into which you will import your new subscribers. By clicking on "Yes", all new Shopify subscribers will automatically be imported into SendinBlue and added to the selected list(s). When a subscriber signs up, a number of confirmation methods are available to you. Choose the one that suits you best. Activating a tracking code allows you to automatically upload your customers’ orders to your SendinBlue account. This is very useful for creating targeted campaigns, e.g. based specifically on customer spending. To activate it, you need to click on "Yes". If you want to send your transactional emails (e.g. payment confirmations, order summaries, etc.) via SendinBlue, click on "Yes" to activate SendinBlue SMTP. This will allow you to optimize email/inbox deliverability and to track individual emails to see whether they have reached their recipient, been opened, been clicked in, etc. Important: your SMTP account must be activated. If this has not been done, our customer support team can help. 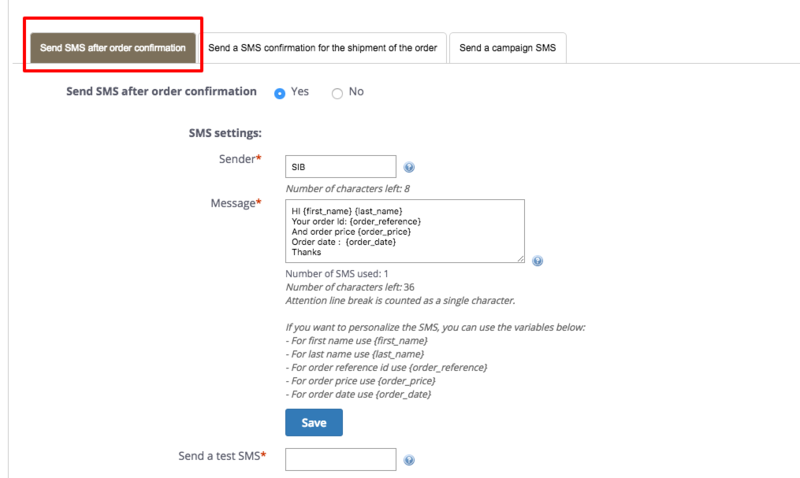 In the SMS section, you can also activate a low credit notification, an order confirmation SMS or an order delivery SMS. 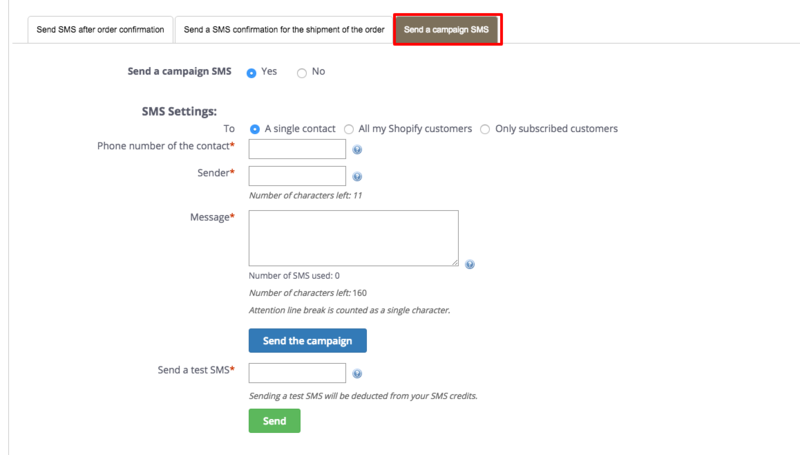 You can also send SMS campaigns to your Shopify contacts directly from the Shopify back office. All you have to do is select the recipient(s) and prepare your campaign. The SendinBlue plugin for Shopify allows you to optimize your communications with your customers and simplify the interaction between your Shopify website and your SendinBlue account. How do I connect SendinBlue with my website?